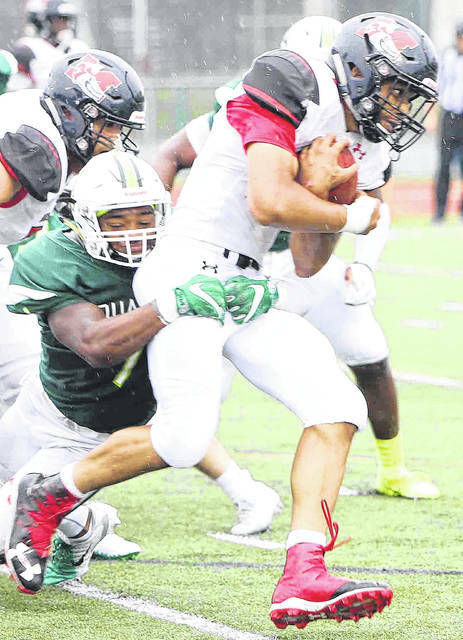 Tre’Quez Parks is the leading tackler for the Wilmington College football team this season. Baldwin-Wallace has a nine-game winning streak over Wilmington College. The Fightin’ Quaker football team will try to end that 1:30 p.m. Saturday at Townsend Field. The Yellow Jackets come in to the game with a 5-1 record overall and a 4-1 mark in the Ohio Athletic Conference. The lone loss for BW is to No. 1 Mount Union 56-21 on Sept. 15. The Quakers are 1-5 overall, 0-5 in the OAC. Baldwin-Wallace received votes in the d3football.com Top 25 poll and stand at No. 30. Kyle Barrett is throwing for more than 225 yards per game and has 12 touchdown passes this season. Luke Richardson, a Clinton-Massie graduate, has five touchdown receptions. Weston Trampler, another CM grad, has 26 tackles and leads WC with four sacks. Wezlee Spence, BW’s pass-rusher extraordinaire, has 7.5 sacks and 10.5 tackles for loss this season. The Yellow Jackets, led by quarterback Jake Hudson, are second in the conference in total offense and second in passing yards. BW is first in the conference in third down conversions, moving the chains on 55 percent of their opportunities. In the red zone, Wilmington converts just 50 percents of its chances into scores while Baldwin-Wallace is at 85 percent. While Wilmington is one of the least penalized teams in the OAC (34 for 294 yards), Baldwin-Wallace has been flagged for the most penalty yards this season (503 on 42 infractions). The Yellow Jackets are one of three OAC teams that allows fewer than 100 yards rushing per game. WC and BW are 2-3 in the time of possession category for all games among OAC teams. BW averages 32.21 TOP per game while WC averages 31:13. With 240 points, the Yellow Jackets do much more when they have the ball than the Quakers with just 130 points.